In my more pretentious moments, I think of of the blog as an ongoing art project. It’s sort of a journal of my paper doll activities, plus you can print them out and play with them which is super fun. In the beginning, I never thought I would draw men. Drawing men is not my gift. 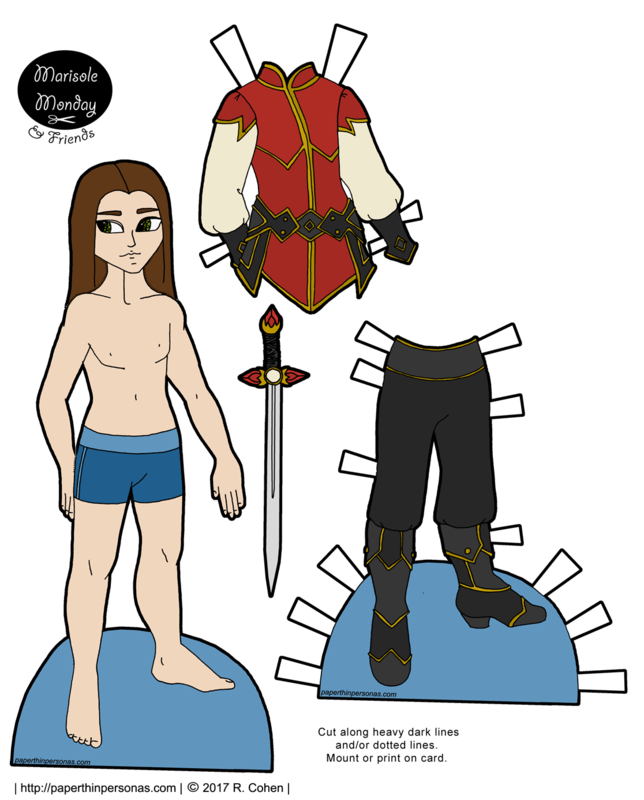 Even now, when I look at Marcus 2.0 and Mikhail, the men of the Marisole Monday & Friend’s paper doll series, I see a lot of problems with them. Their hips are too wide. Their arms a little too long. Like Monday’s Maeghan paper doll, today’s Mikhail paper doll was inspired by an older paper doll I designed called Akemi. Akemi was a fantasy warrior and I think of this version of Mikhail is a warrior king. If you’re not in the mood for shopping, then think about supporting the blog by becoming a patron. Need a more outfits for today’s Marisole Monday & Friends Paper Doll? Find More Guys Clothing Here. i think your dudes are all super cool. and as with the warrior woman in the previous post, i love the color scheme here for Mikhail too!